[PDF] Simple Statistical Methods for Software Engineering: Data and Patterns | Free eBooks Download - EBOOKEE! 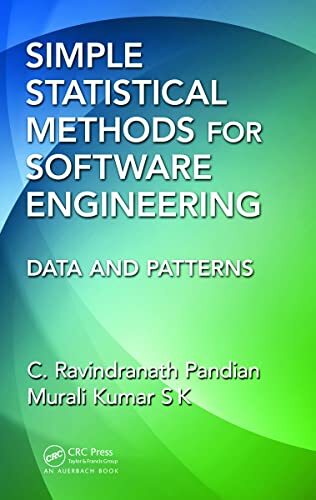 Description: Although there are countless books on statistics, few are dedicated to the application of statistical methods to software engineering. Simple Statistical Methods for Software Engineering: Data and Patterns fills that void. Instead of delving into overly complex statistics, the book details simpler solutions that are just as effective and connect with the intuition of problem solvers. Sharing valuable insights into software engineering problems and solutions, the book not only explains the required statistical methods, but also provides many examples, review questions, and case studies that provide the understanding required to apply those methods to real-world problems. After reading this book, practitioners will possess the confidence and understanding to solve day-to-day problems in quality, measurement, performance, and benchmarking. By following the examples and case studies, students will be better prepared able to achieve seamless transition from academic study to industry practices. Includes boxed stories, case studies, and illustrations that demonstrate the nuances behind proper application Supplies historical anecdotes and traces statistical methods to inventors and gurus Applies basic statistical laws in their simplest forms to resolve engineering problems Provides simple techniques for addressing the issues software engineers face The book starts off by reviewing the essential facts about data. Next, it supplies a detailed review and summary of metrics, including development, maintenance, test, and agile metrics. The third section covers the fundamental laws of probability and statistics and the final section presents special data patterns in the form of tailed mathematical distributions. In addition to selecting simpler and more flexible tools, the authors have also simplified several standard techniques to provide you with the set of intellectual tools all software engineers and managers require. No comments for "[PDF] Simple Statistical Methods for Software Engineering: Data and Patterns".